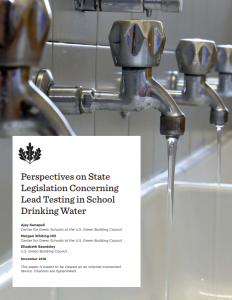 The Center for Green Schools at the U.S. Green Building Council undertook this study, Perspectives on State Legislation Concerning Lead Testing in School Drinking Water, to inform state legislators and advocates as they consider new state laws to address lead contamination in school drinking water. They reviewed the growing body of state laws concerning testing of lead in school water, and they identified relevant reports that could help understand the effectiveness of laws. They also contacted stakeholders with knowledge of the implementation and impact of the state laws. Finally, they analyzed how each law addresses key elements that may relate to the effectiveness of a law in terns of the coverage of schools, implementation of testing, risk, reduction, and disclosure.